A radial forearm free flap is one way of filling a hole which is left when a cancer has been removed. It is one of the most common ways of replacing tissue in the head and neck, particularly after mouth cancers have been removed. It can be used to replace large parts of the mouth and has the advantage that when it heals it does not shrink so that hopefully speech and swallowing will not be greatly affected. What will my arm be like afterwards? Your forearm will be placed in a bandage and sometimes your arm held with the hand up in a special sling for a few days. The bandage is removed after around 10 days and replaced with a lighter dressing. The blood vessels lifted with the flap run from the inside ofthe wrist as far as the inside of the elbow so there will be a row of stitches along this line which will be taken out when the bandage is removed. The nerve which supplies feeling to the skin over the base and side of the thumb is sometimes bruised when the flap is raised. This can mean that the area ends up tingly or numb for several months following surgery. Occasionally it can be permanent. Rarely a bruised nerve can give rise to feelings of pain. You may also notice that your hand does not feel as strong as it was after the operation and sometimes it will feel more cold than it used to in the winter months. In 2-3% of cases one of the blood vessels supplying or draining the flap can develop a blood clot. This means that the flap doesn’t get any fresh blood or, if the drainage vein clots, the flap becomes very congested with old blood. If this occurs it usually happens within the first two days and means that you will have to return to the operating theatre to have the clot removed. Removing the clot is not always successful and on these occasions the flap “fails” and an alternative method of reconstruction sought. I will take a piece of skin from the inside surface of your forearm near the wrist. The skin and fat layer in this region is removed (the flap) along with two blood vessels, one of which supplies blood to the flap (the artery) and one of which drains blood from it (the vein). 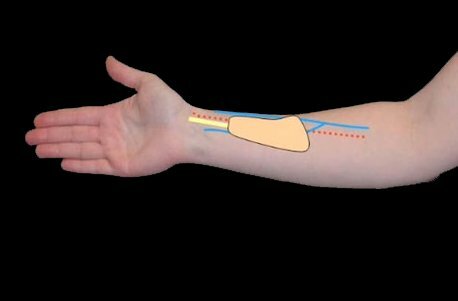 The vessel which supplies blood to the flap is the artery which gives rise to the pulse at the wrist at the base of the thumb. Once the flap of skin is raised it is transferred to the head and neck and sewn into the hole created by the removal of your cancer. The blood vessels supplying and draining the flap are then joined to blood vessels in your neck under a microscope. These blood vessels then keep the flap alive while it heals into its new place. Once the flap is removed from your forearm the hole created is covered with a graft of skin. This graft of skin can be taken from one of several places. Commonly a thin piece of skin is taken from the forearm. Alternatively some skin will be borrowed from your abdomen.